Albert Whitman & Company, 9780807507735, 32pp. Brown Bear is nervous. Today is his very first day of school. What if his classmates don’t like him? What if he can’t hear the teacher? What if he doesn’t have the right clothes? 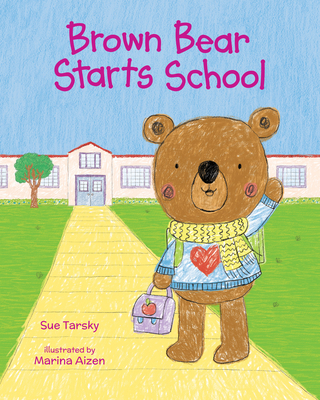 His mother does her best to reassure him but it isn’t until Brown Bear learns that he can do things for himself that he relaxes and helps his friends, too. Born in New York City, Sue Tarsky lived and worked as a children's book publisher for many years in London. She is the author of several books for children, including The Busy Building Book and Kiss the Boo Boo. Sue now lives and works in Chicago. Marina Aizen loves creating sweet characters, full of fun and bright colors, and draws every day in a little notebook she carries everywhere. She lives in Argentina.